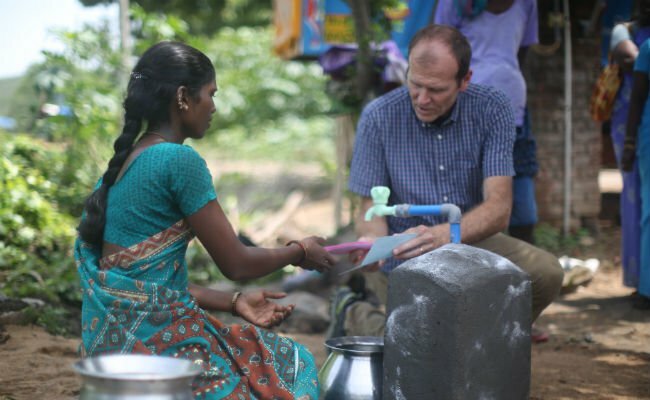 Gary's program WaterCredit has empowered over 2.6 million people by providing access to safe water. The Waislitz Award is given to an individual that demonstrates merit in Global Citizenship, Impact, Innovation, and Potential. Check out last year’s winner Anoop Jain here. This year, Gary White is one of four finalists nominated to receive the award. We asked him a few questions to learn a little more about his work. My name is Gary White and it was out of the belief that the life of a global citizen should be about pursuing the intersection of the world’s greatest need and one’s greatest passion, that I co-founded Water.org, an international nonprofit driven to accelerate an end to the global water crisis. I believe in the dignity and integrity of every human being and I have committed myself to the pursuit of safe water and sanitation for all, so that they may realize their unique potential. I have dedicated over 25 years to this work and I will not stop until everyone has safe water. I have been doing this my entire life. When I was in college learning to be an engineer, I traveled to Guatemala. There I witnessed for the first time the extreme injustices of poverty. The clean water, plumbing and basic sanitation that I took for granted back home (just a few hours by plane away) was nowhere to be found and the people who lived there paid an enormous price for its absence. That price came in many forms; it crippled them economically, devastated their health and life expectancy, and robbed them of their most basic human dignity. My feelings have not changed much since my first impression: I still remember a young girl, maybe five or six struggling to fill a bucket full of water from a contaminated barrel. I saw her pull the bucket with all of her might, place the bucket of water on top of her little head and teeter-totter back down the road to the home. That pail of water must have weighed as much or more than she did. The look of determination on her face is something that will stay with me forever. I felt so deeply that this was just wrong and one of humanity’s greatest failures. I inherently believe that we can solve this crisis in our lifetime and remain truly optimistic about that. “You cannot solve poverty without solving water and sanitation,” - Matt Damon, co-founder of Water.org. Water.org exists to solve the global water and sanitation crisis, which means we are working every day to end poverty too. We do this by putting the power of water directly into the hands of the people who need it. We are empowering the world’s poor with access to small loans for household water connections and toilets. We call this WaterCredit and it is breaking the cycle of poverty and creating a cycle of opportunity – an opportunity to enhance one’s health, education and economic position. Here is how it works: We partner with microfinance institutions to provide loans to a person or family in need for water connections or toilets. The loans through WaterCredit are affordable, making them easy to repay. To date the program has a 99 percent global repayment rate. Once the loan is repaid, it can go to the next person who needs it. This pay-it-forward system makes it possible to help more and more people in ways that will last. To date WaterCredit by Water.org has empowered more than 2.6 million people in eight countries with small loans to access safe water and sanitation. As a model, WaterCredit can reach five to ten times as many people as a traditional grant over a ten-year period. People like Grace and her family in Kenya. A WaterCredit loan helped them install a rainwater catchment system and water tank. Grace envisioned a day when her young daughter would no longer have to collect water. Now with every rainy day, her hope is a reality. We are focusing our energy on solutions that are sustainable and that work at scale. We created a financial model that challenges the traditional aid system, because we know real change will not come from aid alone. We will see vibrant economies, healthy communities and educated children. Ending the cycle of poverty will herald a new cycle of opportunity, unleashing the power of people, their ideas and their will to make our world a better place. We believe access to water and sanitation is the way to help us get there. I believe ensuring access to safe water and sanitation for all is one of the most important issues facing the world today. Water is a fundamental need, yet 660 million people worldwide lack access to safe water. 2.4 billion people, approximately one in three, lack access to a toilet. When it takes hours every day to find and collect water, it’s hard to find time for commerce and community. When nature’s call to relieve yourself means heading home for the day, it’s hard to get through a full day at school. It’s hard to prosper without safe water. Without safe water access in their homes, people have to either scavenge for water or line up at public service taps that may or may not have water that day. Some people pay water vendors high prices for water of questionable quality. All of this interferes with the ability to work or go to school. I see water and sanitation as the beginning of most of the solutions for all the development issues to live truly healthy lives. Without solving the water and sanitation challenge, we will not end extreme poverty and will fall short of realizing the full potential of communities, nations and the global economy. I believe that the life of a global citizen should be about pursuing the intersection of the world’s greatest need and one’s greatest passion. Once you identify that intersection, learn more about the issue, find the best organizations that are addressing the issues and support their work. One of the things I’m most excited about is the next generation of change makers. Global citizens everywhere are stepping up in small and big ways all over the world and I can’t think of a more exciting time when the enthusiasm and eagerness to make a difference was so enormous. I have so much confidence that through platforms like Global Citizen, we will bring about a world free from extreme poverty. When you vote for me, you are voting for the people Water.org works to empower every day through access to safe water and sanitation. You are voting for women like Vimala. 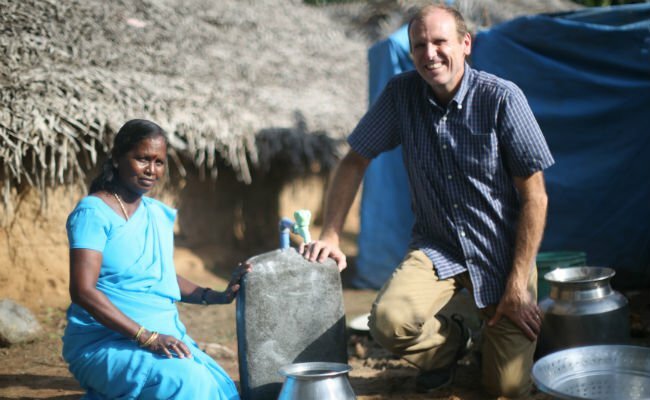 Before Vimala and her family had to spend three hours a day carrying water from a communal source. Now, thanks to a WaterCredit loan, the family has access to safe water at home, creating more time and energy for a better life. The money that will be gifted to Water.org if we receive the most votes can help transform 4,000 more lives with access to safe water. The visibility earned from this award will help us continue to forge partnerships with governments, corporations and institutions so that together we can break the barriers that separate people from water and end global poverty.